Hiroyuki Nakajima has finally made it to Major League Baseball in the United States, with the 30 year-old Japanese shortstop joining the Oakland Athletics this week. It is a welcome move for Nakajima who failed to agree to terms with the New York Yankees in 2011, instead staying with Saitama Seibu for another year. Earlier this week however, he held a press conference with the famous general manager of the Oakland A’s, Billy Beane — immortalized on the big screen by Brad Pitt in the 2011 hit ‘Moneyball’. Nakajima has signed a $6.5 million two-year contract with a franchise that enjoys relative success despite the fact that it has one of the lowest payrolls in baseball. Nakajima’s impressive record means the A’s are not taking on much risk. Nakajima has been named in the Japan All Star team no less than eight times and has won the Gold Glove three times. He has a .302 career batting average with 162 homers in 11 seasons. The Yankees bid $2.5 million for Nakajima’s rights in 2011 but failed to make a deal and the player decided to stay one more year in Japan in order to become a free agent. “I'm very grateful having made that decision," he said through an interpreter. "To be wearing an A's uniform right now, I'm just very excited." If that was not enough for Japanese fans, relief pitcher Koji Uehara signed a one-year deal with Boston Red Sox. The 37 year-old, who has appeared for the Baltimore Orioles and the Texas Rangers’s base salary is a reported $4.25 million. While a compatriot heading to the major leagues still makes headlines and causes excitement in Japan, it is not such a rare occurrence. 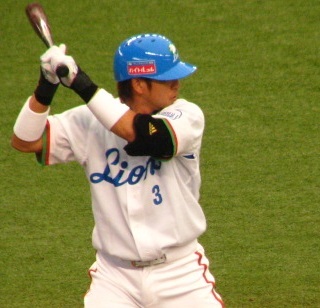 The first was Masanori Murikami in 1964, but the most successful Japanese player was Ichiro Suzuki, who made the All Star team ten years in a row from 2001 to 2010. In 2013, there could be as many ten Japanese players in the MLB and there have been over forty in history. Major League Baseball: Meet Japan's All-Time "Hit King"Samurai Japan Take on the MLB All-Stars … and WinTanaka Enters Training Camp to Much Fanfare, High ExpectationsYankees Pay $175 Million for Japanese Ace TanakaBalfour Rage: Just What the Oakland A’s Need?